SW Portland's unofficial Offical Bird is a more intersting creature than you might imagine. understanding of "intelligent" is limited by our own questionable intelligence. Which brings us to the this month's topic: crows. at it. Their existence precedes our own by millions of years. arguably the ultimate survivalists. And, gosh, they don't even own guns. swiveling and cocked, what are they watching? likely part of a single crow family. Crows form close, protective family bonds. Pairs mate for life. Sallinger. A fledgling's eyes are blue, not black. friends. We feed crows, either purposely but ignorantly, dulling the crow's survival instincts. local, state and federal laws. seemed to be saying, "Don't you have something better to do?" over generations of crows. Crows don't forget what they learn and what they've been taught. our own experience with crows as well. exposed to crows than the others. foraging for food for its young. Or maybe Dave's red Honda was simply seen as future trouble. 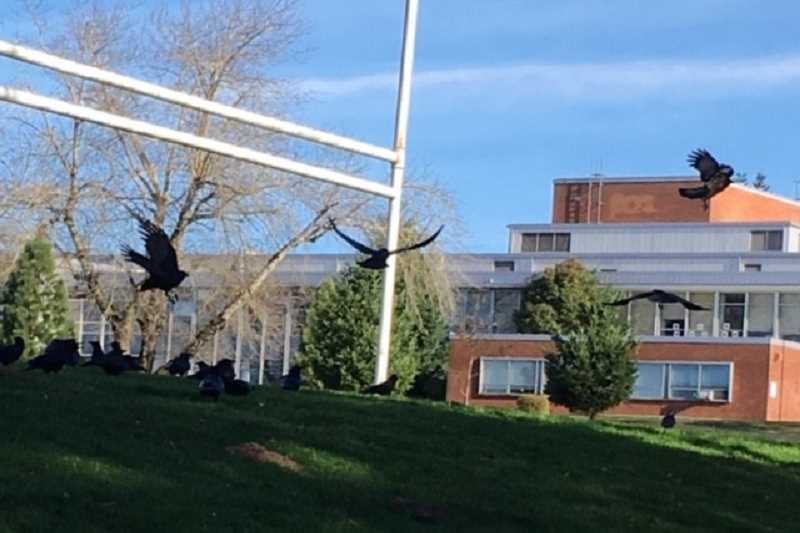 common is that a group of crows is "ganging up" on and nipping at an injured crow. encouraging and prodding a fallen fledgling ... urging it to fly...helping it survive.